The picture isn’t too great, but are you sure it really jumped forward? I don't think your timing chain broke or snapped. MBZ diesel engine is interference engine and all valves would be bent out of shaped if it did snap. Engine will NOT run. I suspect it is something simple. The valve cover cracked for some reasons ( need to find out ) and oil get onto the turbo or exhaust to cause the burning smell, BTDT. Just remove the cover, remove all debris, turn the engine by hand and check for any foreign objects. Good luck. btw: I seriously doubt the timing is jumped. x2 The picture shows both sections of the chain on the driven sprocket. The visible sprocket drives the intake cam. Something came loose and rode the chain to a weak spot in the valve cover. 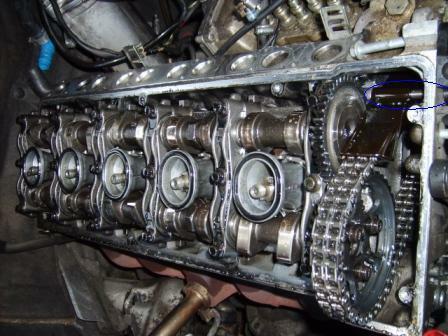 Despite the panic of others, replacing the timing chain and components isn't a big ordeal for those that have repaired engines. I'd rather fix a known good engine than get a high mile unknown used one that might suffer the same failure. This late in the game finding a low mile unit will be difficult and $$$. The chain runs the exhaust cam and a gear drives in intake cam. In your pic it looks like the front half of the exhaust cam chain sprocket broke for unknown reasons. Look at the front most row of chain. Starting from the passenger side there are 2 teeth visible but when moving towards the driver side the teeth are missing. Given the engine still ran smoothly, valve bending didn't occur. As for valve bending / not bending if a chain breaks / cams jump out of time, idle or freeway speed makes not one bit of difference. Valves can be bent by cranking the engine with the starter or even by hand. The best case is when a chain breaks clean , the cam stops and one intake and one exhaust valve of different cylinders bends. There will always be some valves open at any given point in the cams rotation. There are some dual cam engines that are called valve benders but can survive a belt breakage. Supposedly the Chrysler 2.4 used from 2000 to 2010 ish in the PT Cruiser , Stratus , Cirrus and mini vans is an example of maybe maybe not. If the cams stop with valves mostly closed, valve bending won't occur. Worst case is when the chain hops a tooth or more and cam continues to turn. In this case all valves are opening at the wrong times and , depending on if single cam / dual cam + type of drive, either all exhausts or intakes will bend. Thanks SL320 and sixto.... I have repaired engines in the past when I was a mechanic so I may take a shot at it. There appears to be a timing cover just under the valve cover, not much information on line about the OM648 engine, as I believe this is. I suspect that first I'll get the timing marks aligned to insure that it is 100% on time, then I'll go from there. As stated, there are in fact teeth missing from the front of the cam gear, been looking on line for parts, most available are from foreign countries, I'd hate to pay full dealer price for a valve cover or any other simpler parts that need replacing. My question at this point is that since it is apparent that the cam gear's teeth were damaged do I need to replace the timing chain as well? 1970 250 Coupe 212,000 mi. 1977 300D 204, 000 mi. 1979 280se God Only Knows! Yes, replace the chain as it has become stressed. I'd also be looking into pulling the oil pan and removing broken parts. Does this engine have a separate steel lower pan? Have a look on car-part.com this searches participating salvage yards, that might turn up a used valve / timing cover. If that does not work, look for self serve yards. Always get pricing from the dealer network, parts that don't sell in volume through the aftermarket are frequently bought from the dealer parts network and priced much higher. Look on youtube for legitstreetcars Alex's recent content is on his CDI. He got a manifold from a youtube viewer, so chances are that viewer has a parts engine. It may be a longshot, but may pan out in the end. How different is the timing system / valve cover from our guys engine vs a 1995 OM606 ? Whatever happened, it IS worth fixing in my opinion. While I'm all for supporting this site, over on Rock (of) Auto, they have lots of engine parts on deep discount wholesale clearance. Valve cover gaskets are $ 4 , timing chain $ 66 , guides $ 5 to 6 , tension adjuster $ 57 , oil pump chain $ 17 , intake gasket $ 8 . I've also found that there is a early 2005 and late 2005 + so be sure to ID your engine not just the car in case parts were changed along the way. x2 The picture shows both sections of the chain on the driven sprocket. The visible sprocket drives the intake cam. Something came loose and rode the chain to a weak spot in the valve cover. I agree with Sixto, especially if the chain rails and tensioner are OK.
Can you post a photo of the missing teeth? I'm not seeing that in your previous photo. The chain doesn't automatically require replacement, but it would be a good ideal to mark a link on the chain, and turn the engine by hand so you can inspect the entire length of the chain. If timing marks are aligned, AND stretch is within factory specs, AND there is no visible sign of damage to the chain... I'd leave it alone. You really should drop the oil pan and inspect for debris in the sump. This may also help solve the mystery as to what caused the valve cover to pop in the first place. It may be a miserable job; I'm not sure what's involved. Replacing the valve cover won't be cheap either, new is ~$250 from discount dealers, a used cover may be difficult to locate. If you don't identify the root cause, you'll be really unhappy if you install a new valve cover and have the replacement cover suddenly get extra ventilation like the first.